Ani Hajderaj | News, Social Media, Electronic Music and Life. News, Social Media, Electronic Music and Life. A growing yet unfortunate trend in Toronto is nightclubs closing down and condo buildings going up in their place. This past weekend one of Toronto’s hottest clubs closed down, Footwork. It was a place the respected electronic music, very famous for house music however. This place kept it real; no such thing as a dress code, everyone was welcome and most importantly it had a very friendly atmosphere. You can go in there alone and meet awesome people. Footwork had it’s own community of people who would go there almost every weekend. Footwork for me will always be memorable, it’s where I spent my new years even 2012 with my girlfriend. We heard DJ Sneak spin a set using vinyls. It was a great experience and the music had us moving throughout the whole night. Regrettably so, I was unable to go back but I made it a priority to check out the closing party this past Friday. Footwork is the only nightclub in Toronto that I can compare to Stereo Montreal; a place that respects the sound and for any music lover, this is important. In it’s earlier years FW was known as an after-hours but the vibe has stuck. The purple lighting and the alleyway gave it an underground sort of experience which I love. The intimate interior of the club is inviting and on the dance floor very few are using their phones and are focused on dancing and socializing with their friends. The place had a lot of charm, from the twin disco balls to the LED panels above the DJ booth tucked away giving people lots of space to dance. It will be missed and I am glad I was able to experience it before it went away. However the organizers who brought the amazing DJs and events to the venue are still active so be sure to stay tuned for updates on Jonathan Rosa’s twitter. 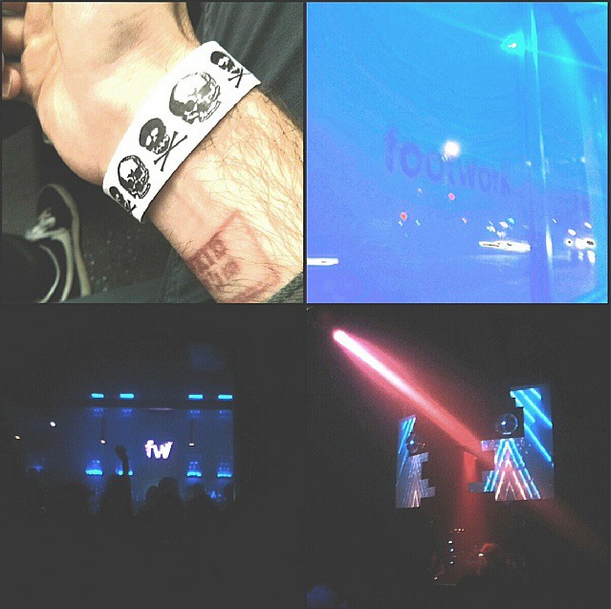 It’s been a while since I’ve been to the Guvernment complex and so I was invited to go this past Wednesday. They were launching the brand new Microsoft Surface computer that has touch technology and the new Windows 8 interface where everything is cascaded across your screen. Very clean looking design overall. Upon my arrival I noticed a projection promoting the Surface on the “Kool Haus” sign located above the ticket booths and also a much more corporate crowd than what you usually see when you’re going to the Guv for a night of dance. A very nice touch to the venue were the cubes in the bottle service area. They had Microsoft icons on the light cubes, this gave the Haus some Microsoft swag in addition to the surface logo on the LED panels throughout the room. Those with VIP access, were served complimentary alcohol for the duration of the event and as any corporate launch party I had the pleasure of viewing tweets on TV screens from my friends and I.
Deadmau5 played a very nice set, albeit short, he played a good spectrum of sounds including some of big hits and some experimental stuff. Deadmau5 is well known for playing mostly his own tracks in his sets which has become rather uncommon recently. He also played some techno which was a nice touch. The event did not get uncomfortably crowded, the place was definitely busy with lots of room to dance and socialize with friends. I was very pleased by this. 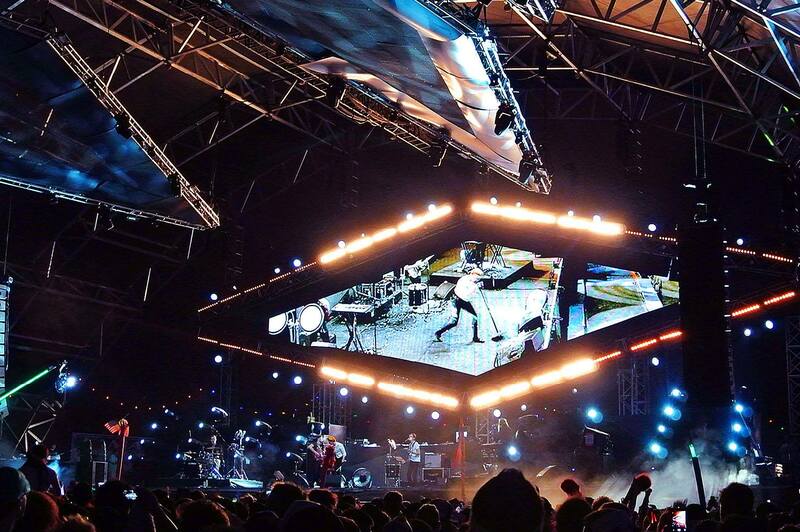 One thing that surprised me the most was the production that was placed on the stage, I was expecting a very simple DJ booth set up, but Microsoft brought out a big stage set up including LED panels and a geometrical booth. The lights were also on point, giving the show a beautiful aesthetic. Big thanks goes to Veritas and Microsoft for throwing such an amazing party. Never would I imagine that a place like Las Vegas would take people back to their childhood. But that’s exactly what Insomniac’s premium festival experience, Electric Daisy Carnival, did. EDC LV was a memorable experience not only because it had an endless line up of DJs and performers; the vibe and unity created by those in attendance also extended the experience beyond the Motor Speedway and into the strip of Vegas itself. The Vegas strip was decked out in advertisements for pool and nightclub parties with DJs faces on them and cars marked with peace signs, flowers, smiley faces and rave-related messages were on every street. Many dub Las Vegas as the new Ibiza and they might be right. Vegas has been a popular spot for DJs to land residencies this year and every day I was hearing about my friends’ experiences at the pool parties they were attending. The night before the first day of EDC, my Toronto friends came over to my hotel suite and we shared our experiences on the strip so far over drinks. Shifting our focus to the main event, EDC, the guys were talking about their LED gloves and orbit lightshows while the girls showed each other their custom made outfits for the festival. I decided to sleep early to rest up for a very long weekend of festivities ahead of me, but I was very excited. 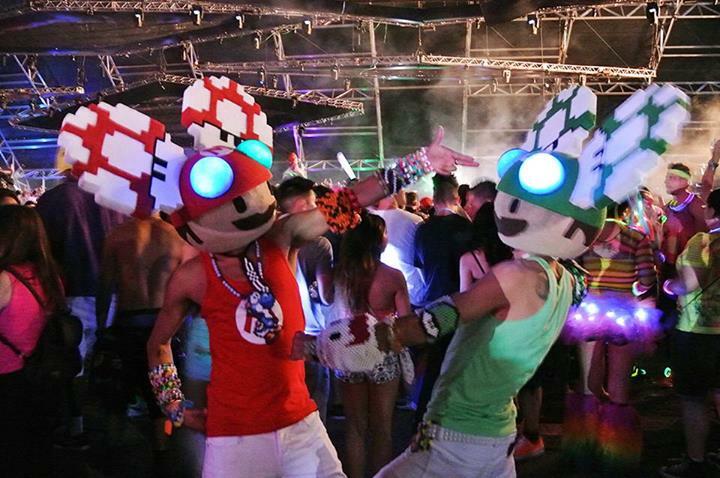 The EDC journey started at the line up for the shuttle – everyone, including Insomniac staff, were cheering together. The bus ride lingered with conversations about rave experiences as well as everyone’s game plan for the weekend. Many were also trading kandi while in the lineup, on the bus, and at the ticket booths. The shuttles were very accessible and arrived at the speedway in a timely fashion. This year they took a route that cuts through the US Air Force base making it safer and speedier to get to the festival. I highly recommend buying a shuttle pass directly from Insomniac to avoid any issues. As I arrived at the venue, I remember, vividly, the crowd outside looking like a sea. My friends and I were immediately hit by a rush of energy and we were instantly hyped to start partying. Despite there being hundreds of people around the area, the staff at will call was very helpful and we managed to get our entry cards in less than 10 minutes. A memory I will not forget is walking through the stadium and seeing the lights, stages, carnival rides, art installations with the desert and the orange sunset in the background. It was a breath taking view. On the grass grounds of the speedway several art installations where situated and that’s where people mainly went to sit down, eat, give lightshows and in some cases had a disco nap. Once we got inside, we stored our basics in our reserved lockers and started exploring the festival. We got on the ferris wheel, where my girlfriend shed tears of joy at how beautiful the scenery was after the sunset. Some of the other rides gave me the time of my life too. I remember going on the Mega-Dropzone and, as it raised me in the air, I caught a glimpse of the Las Vegas skyline before it dropped me straight to the ground where I was back in a dream world. It was a humbling experience. As for the music and various stages, Basscon really captured my attention with the psy trance and other hard styles of dance music. 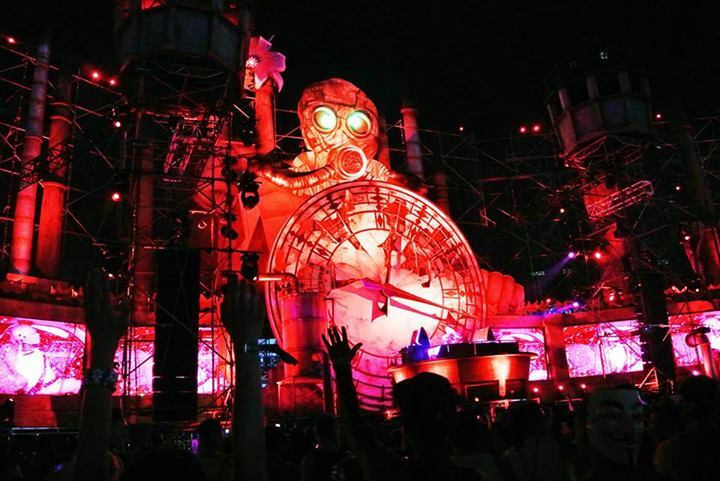 The stage had a character in the centre overlooking the audience, wearing a gas mask with LED screens in the eye sockets. Three watchtowers were installed in the area and there was a lot of smoke and fire coming from the stage when things got crazy. 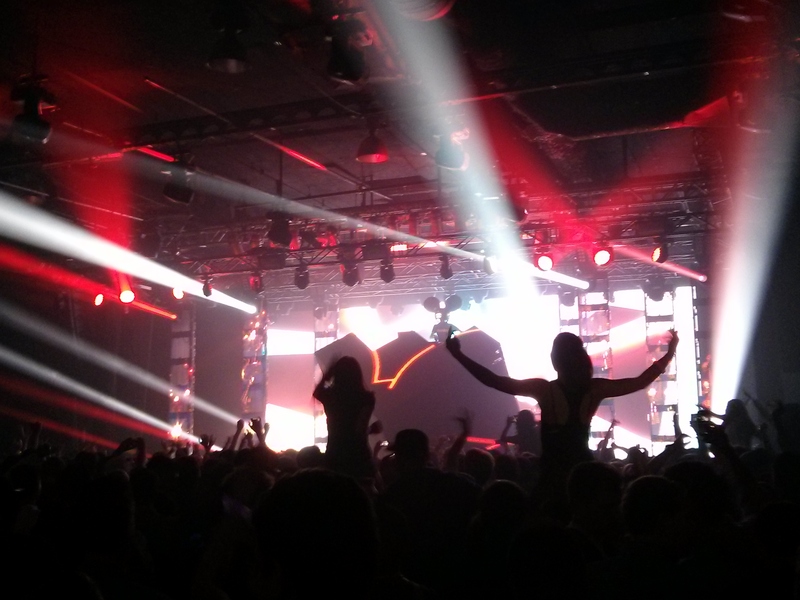 Lisa Lashes, Simon Patterson and Bryan Kearney had great sets and fit the vibes perfectly at Basscon. Above & Beyond was able to attract the biggest audience to my experience throughout the weekend. As Carl Cox vacated the DJ booth, the crowd went silent until the group therapy ribbons showed up on the screens. During that set, the Kinetic Field stage had a vibe that is hard to describe. During the breakdown of Walter White, they had imagery on the LED screens showing a map of the world pulsing; for me that was a very moving experience as it made me think of all the struggles we go through in life and yet, how so many people from all over the world came to EDC to experience and share a moment like that. 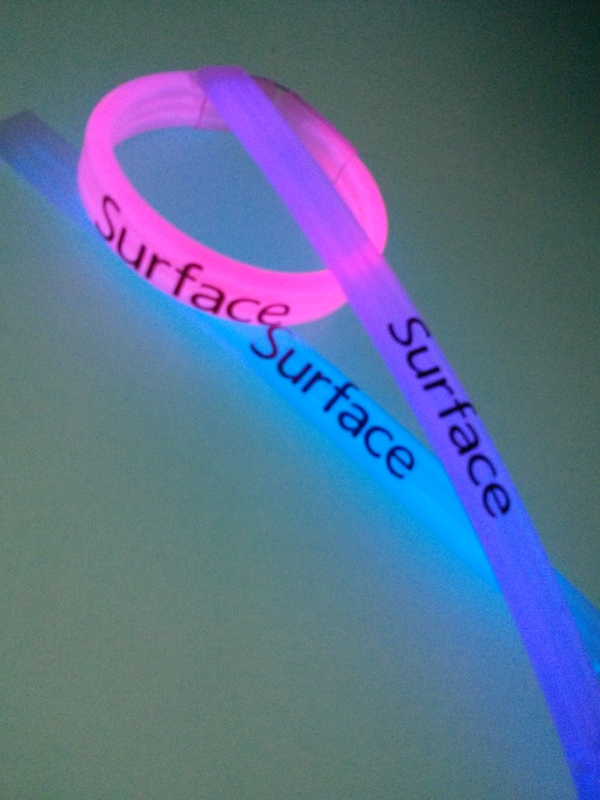 It was a very positive feeling that I only (and rarely) get to experience at raves. It is also why I go to electronic music events. The main stage wrapped around the guests and had a forest theme throughout. The DJ booth had an owl wrapping its wings around it and they would open up every time a new DJ got on the decks. The main stage was always full of energy, every time I walked by big anthems were being played and there was more traffic than usual compared to the other stages. Neon Garden and Circuit Grounds were simply designed but had really cool lighting and production to them. My most notable experiences at these stages were created by Adam Beyer, Green Velvet, Dirty South and John Digweed. La Roux also captured my attention at Circuit Grounds as she brought a live band and provided live vocals. I thought it was a great break considering most of the line-up was for DJ sets. La Roux had a very positive and uplifting atmosphere that was very different than what that stage was typically hosting. 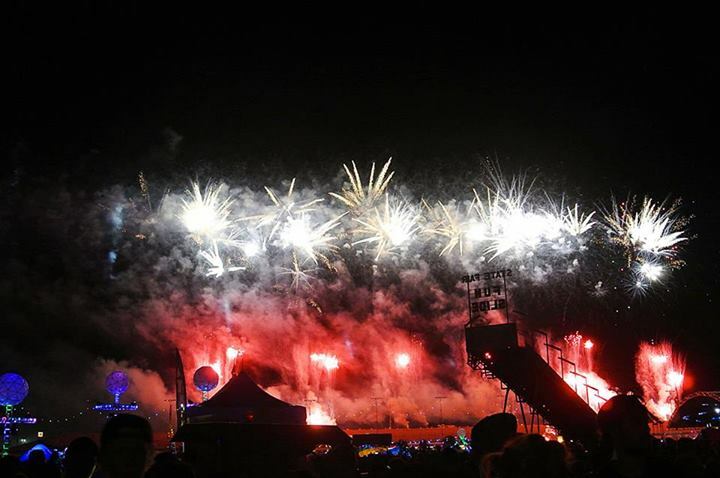 The BassPod had a round design and featured heavy drum ‘n bass, dubstep and trap DJs. Out of all the stages, I would say that it was shooting fire the most and had lots of MCs. Although I wasn’t into the music, I thought it was a great experience regardless. My favourite experience that weekend was hearing Booka Shade at Cosmic Meadow before leaving to go back to my hotel room. Some amazing deep house was being played – the kind of stuff I never get to hear back home. It had a very after-hours feeling to it and it was just amazing to hear sounds like that outside of a club environment. The main thing I noticed about EDC is that even those who were new to the music were being very respectful of everyone. It helped that every stage accommodated all different tastes but I encountered some people who were stepping out of the comfort zone; where in most cases they would be at a big room house DJ set, they would lose themselves in the techno area – something I don’t see very often in Toronto. Insomniac turned the racetrack into a magical place where everyone could become a kid again and have fun without judgment, negativity and danger. From the entire weekend, my only moment of sadness came when I was looking out the airplane window and spotted the speedway fully lit, just close enough to notice that half of the stages were already taken down. 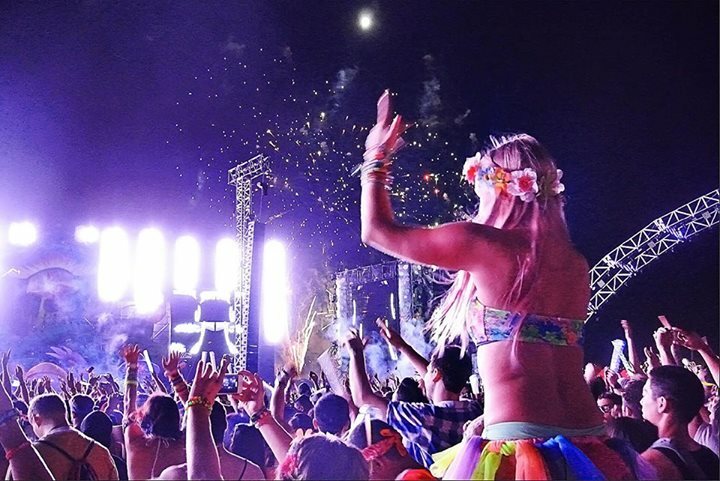 There are a thousand reasons I could list of why you should attend Electric Daisy Carnival but it truly is something any electronic music fan should experience firsthand. The crowd, staff and security were diverse, friendly, accepting and down to have a great time. All of these elements came together and made the festival such an amazing experience that I will forever hold in my memory. All images taken by Constance Chan. Blog initially posted on a blog I am no longer affiliated with. Re-Posted on January 1 2014. The Toronto councillors are giving the Toronto Zoo elephants the gift of freedom this Christmas. The elephant in some cultures is a sacred animal. In Thailand the white elephant is considered to be holy. In countries such as Sri Lanka, elephants are used in festivals. Without a doubt the elephant is one of the largest mammals to survive on earth and as majestic and beautiful they may be, they are still the centre of attention in political and ethical issues. This large animal requires lots of space to be happy and to stay alive. As elephants are indigenous to South Asia and various regions in Africa, they require warm weather in order to live. Elephants are also victims of animal poachers who go after their tusks for the production of various consumer products such as piano keys, shirt buttons and ivory jewellery. This highly illegal industry, generates lots of money and with that in mind, conservationists believe elephants may face extinction by the year 2020. Toronto is simply not an ideal place for an elephant to live. The weather is too cold for the majority of the year with only a few warm months of summer. Among budgeting discussion, Rob Ford’s plans to cut down on the “gravy” and the TTC fare hikes, Toronto has also been facing some drama over three elephants at the Toronto Zoo. It’s not just Torontonians the city council needs to please, but also the elephants in the Toronto Zoo due to the high price of building more adequate living conditions and space throughout the zoo for the elephants. The current space dedicated to the elephant program is only about an acre and it was built 30 years ago. Councillor Michelle Berardinetti, was very adamant about moving these three elephants to a sanctuary in California. The vote in the city council was 31 to four in the decision of moving the elephants (Iringa, Toka and Thika). How will these animals be moved to California all the way from Toronto? Zoo board member, Glenn De Baeremaeker, indicated that the elephants have been receiving training by animal trainers. A lot of the exercises include basic stretches and other movements that will help maintain the animals in shape. The elephants will be moved inside large crates and shipped out of Toronto to their paradise in the Performing Animal Welfare Society (PAWS) sanctuary. The elephants are being prepared to be moved by truck or possibly air transit, in either case the keepers have been training them to adapt in closed quarters for the duration of the trip. Earlier in the fall the elephants were showcased to guests of the zoo doing their stretches with the assistance of zoo keepers. The stretches and exercises are designed to engage various parts of the elephant’s body so they are able to keep up with the movement of the truck or plane while on the road. Their favourite snacks tend to be apples. 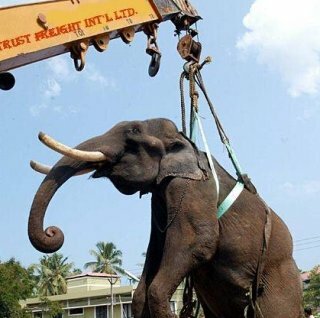 In some cases private logistics companies are in charge of moving elephants. In this case PAWS will be the one in charge of moving the elephants from Toronto to the sanctuary. Councillor Raymond Cho indicated that the elephants are probably going to move by trailer, which means land transit, but they could move by airplane depending on the weather conditions. “If they move in the middle of the winter, like January and February, most likely they will go by air cargo,” he said. The animals will move by trailer on land if they move during the month of April, since the weather is more appropriate around that time. The moving expenses will be paid for by PAWS which come to about $300,000. “I went to see PAWS myself and make sure that the elephants would go the right place. I spent my own money; I went November the sixth and came back. I was most impressed, this was like elephant paradise,” he said. Raymond Cho is one of the councillors who are adamant about moving these animals to a good place for their retirement. In addition he was impressed by the number of stations they had in the sanctuary. “It’s wide open, they have a green field, they have mountains, they have a little lake where they could go swim and they even have a Jacuzzi!” he said. Once the elephants arrive at the PAWS sanctuary they will receive service around the clock by professionals who work on site. Michelle Berardinetti is another councillor who feels strongly about retiring the elephants to the PAWS sanctuary. She also believes that the elephants could be transported before April. “They could actually have them ready by March. It only takes about anywhere from 10 days to a few weeks. The maximum would be a month or two to train the elephants, to prepare them to move, we have actually given them an extra few months just because of the permit process,” she said. The permit needs to be processed because this is an international operation since the animals will be moving from Toronto to California. “It could take about 60 days to prepare for that,” she said. Councillor Cho believes it’s a win-win situation for the animals and the city of Toronto, but there has been some backlash from the zoo keepers of the Toronto Zoo. Some of these keepers posted negative comments against Councillor Berardinetti because they simply don’t want the elephants to leave. “It’s probably because their jobs are at risk. If the elephants are transported and we don’t have the elephant program any further then we don’t need elephant trainers,” she said. Councillor Cho thinks their backlash towards the city council stems deeper than that. “They are upset the elephants will leave them. In psychological terms it’s called ‘separation anxiety’,” he said. He believes that because the trainers have looked after the elephants for so many years over time they feel connected to the animals and are becoming upset that they are no longer going to see them. Councillor Cho is experienced in dealing with zoo politics. Cho is a board member at the zoo. He says the keepers haven’t been to the PAWS facility and given his background .he feels it’s the best place for the animals to be. “The Toronto Zoo is a very good organization and animal centre. The reasons the Toronto Zoo should decide the elephant to go is first, the weather is too cold for elephants and the Toronto Zoo doesn’t have enough space,” he said. Councillor Berardinetti has been involved as part of the legislation of animal welfare issues for over 19 years while she was working at Queen’s Park, she has consulted with professionals regarding the animals and they all spoke favourably for the sanctuary in California. “Our role as city councillors is to get the best advice,” she said. Aside from the welfare of the elephants, this move is showing to be beneficial to the city of Toronto. To build a large enough facility in the Toronto Zoo that can accommodate these large animals would cost the city about $20-$50 million, but sending them away can save the city $600,000 a year. “We personally are exceedingly happy because we are giving the best Christmas gift to the elephants: freedom,” Cho said. Not only might this be a great Christmas gift for the animals, but also the Toronto tax payers too, as they won’t need to worry about paying more taxes than they should for elephant upkeep. A Canadian HUF DUF operator spoke to students about women’s role in the war. As Centennial College students and faculty took their time to remember, a war veteran shared her experiences as a HF/DF (high-frequency direction finding) operator in the Second World War. Margaret Haliburton, 89, was one of the first to hear about Adolf Hitler’s death. The message was transmitted in code where a woman with a German background deciphered the message, she described. “We came back to households that treated us as the children we were as we left, as the saying is ‘we left home as a child and came back as a man or a woman,’” she said. During the war women took part in the home front, where young women joined the forces to produce arms and to collect intelligence. It was a time where everyone was equal regardless of gender and socio economic status, Haliburton described. “The equality was gone. I had full equality when I was in the Navy. I was working with girls who were extremely rich and extremely poor. We were equal. When we went home the differences showed,” she said. 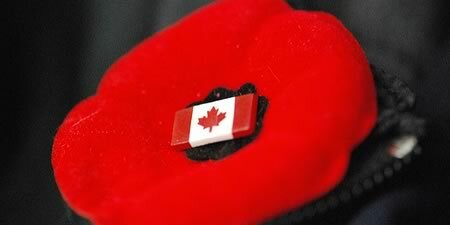 A lot of soldiers came back ended up homeless, some even came back with shell shock (or also referred to as post traumatic stress disorder) and were not getting treatment for their condition. “A lot of hurtful things where said about them, and I always told them ‘if you see them homeless or drunk, just remember the hell we went through,’” she said. Margaret Haliburton joined the Royal Canadian Navy and served as a WREN (Women’s Royal Naval Service) and she currently speaks to people about life as a Canadian woman on the home front.